On May 24,1902, the Archdiocese of St. Paul and Minneapolis assigned Rev. Anthony Szczukowski as St. John’s first Pastor. The parish was legally established shortly thereafter, on July 16th. In October 1908, the parish purchased land for a cemetery consisting of 3,636 grave sites. The cost was $450. The first burial at the cemetery was in September of 1909. The cemetery was re-dedicated in 1959, and today, as in the past, the Cemetery Ministry is an important part of the St. John’s parish community. On June 14, 1999 a St. John’s Cemetery Committee was formed and many enhancements and improvements have since occurred. Perpetual care (ongoing care assumed by cemetery management) shall consist of general landscape maintenance, including the care of grass, trees, fences, pavement and common area plantings. Perpetual care does not include repair or replacement of vases, baskets, or memorials placed at the grave site. The cemetery management has the right to establish policies that regulate the use of all decorations on individual grave sites. No coping, fencing, hedging, borders or enclosures of any kind are allowed around any grave. “Walks” of brick, cinder, tile, terra cotta, sand, cement, gravel, or wood are also not allowed. Decorative rock, solar lights, and mementos are not permitted. No decorations of any kind may be placed on the cemetery fence, or on trees, shrubs or plantings. Cemetery management will remove unsightly or inappropriate decorations. Decorations that are left in place outside of the specified time frames or blown from their original locations will also be removed. Christmas decorations such as wreaths may be used during the Christmas season, but they must be removed by March 1st, weather permitting. Shepherd hooks and both real and artificial flowers may be displayed from April 1 through October 31. However, they cannot be put in place more than 3 days prior to the following holidays, and they must be removed within two weeks of these holidays: Easter, Mother’s Day, Memorial Day, Father’s Day, and Independence Day. Two weeks after Memorial Day, all decorations will be removed from the cemetery for annual maintenance. Decorations can again be placed on graves beginning June 15th. We ask that all vases be turned over when not in use. All vases must be turned over or removed by November 1st to accommodate snow removal. The St. John’s Cemetery management appreciates your understanding and cooperation in helping to keep our cemetery well organized, uncluttered and pleasing to all those who visit. Thank you! All grave markers at ground level only. Donations to the Cemetery Perpetual Care Fund are appreciated. More complete cemetery policies are available on request. Same fees apply to parishioners and non-parishioners. 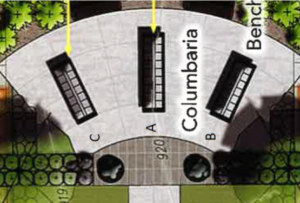 Watch the Eickhof Columbaria video featuring our columbaria!